Same pinch again! Wish mine was as pretty looking like yours. You have perfectly pulled off the pull apart bread. Looks amazing! Thats a gorgeous pull apart bread and the way you shaped the dough sounds very different from the usual pull apart bread. Awesome Bread there. Yes seriously I will miss the morning activity of posting and social media stuff too. :-) Same pinch for zaatar but I didn't prepare it as pull apart. Love yours and it has come out perfectly. Stunning bread and a work of patience , seriously looks like an artist at work . Perfect finale to the marathon , kudos Harini , you had me glued to your interesting breads everyday . 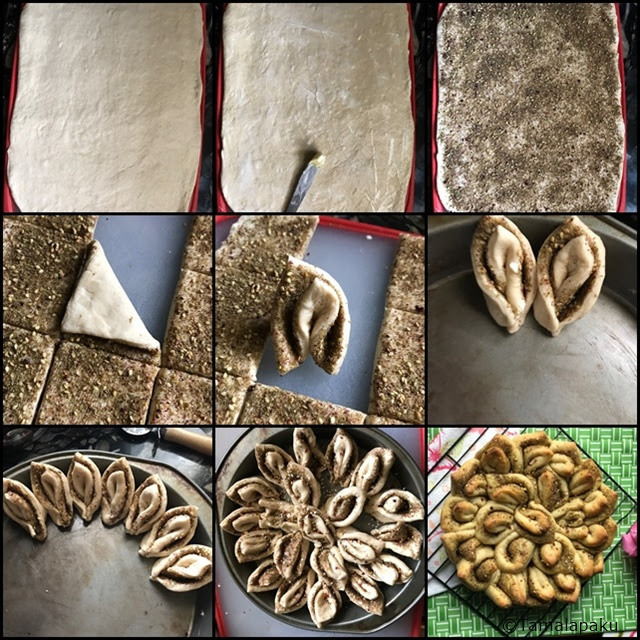 I've seen two Zata'ar breads back to back, makes me want to try some soon! So beautifully shaped and baked, looks too pretty to eat. Such a pretty bread to end the marathon with Harini. That za'tar bread looks stunning. Simply awesome Harini, what a stunning bread!...and I have enjoyed all your dishes so much..thanks for the wonderful run! Omg this is a show stopper. You really made it so beautifully. Hats off to your patience. Zaatar totally rocked this day.. Could see zaatar being used in so many version !! Lovely share!! I wanted to make something using Zaatar, but made a different bread instead. So flavorful and this would be a great evening bread to serve.